No forks? No problem. 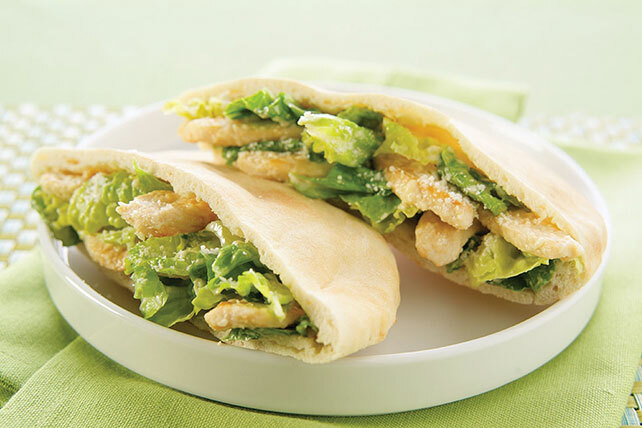 Stuff your chicken Caesar salad in a pita to make this delicious, hands-on Healthy Living sandwich. Toss lettuce with chicken, cheese and dressing. Substitute 8 (6-inch) flour tortillas for the pita halves. Cover tortillas with chicken mixture; roll up. Substitute 1 pkg. (6 oz.) OSCAR MAYER Deli Fresh Grilled Chicken Breast for the cooked fresh chicken strips.